ATLANTA, Georgia (CNN) -- So much for Southern hospitality. The attack took place on April 27 at Southern Tracks Recording in Atlanta, Georgia. When Pearl Jam -- the Seattle, Washington-based grunge rock band -- was in the Atlanta area late last month, bass guitar player Jeff Ament and a band employee were mugged outside a recording studio, a police report shows. According to the DeKalb County Police Department, Ament and Mark Anthony Smith were attacked shortly before noon on April 27 when they arrived at Southern Tracks Recording. Southern Tracks is the home base of producer Brendan O'Brien, with whom the band has worked before. According to Rolling Stone, the band is recording a new album with the producer. Three men reportedly emerged from a nearby wooded area wearing masks and brandishing knives. 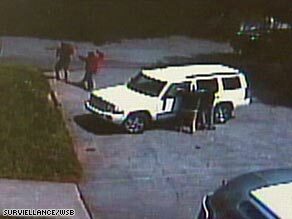 They smashed windows of the rented Jeep Commander, snatched a BlackBerry phone and other belongings, and demanded money, the police report shows. The suspects allegedly got away with more than $7,300 in goods and cash. She said he "suffered some lacerations" on the back of his head and was treated at the scene. His backpack was also snatched, she said, and included inside was Ament's passport. "At this time detectives believe the victims were not specifically targeted," Parish said. "But they believe the suspects were familiar with the studio because of its isolated location." Though surveillance cameras captured the incident, the masks worn by the attackers have made identifying suspects difficult. Witnesses reported seeing the suspects flee through the woods and hop into a waiting black Maxima, Parish added. Anyone with leads on this case is encouraged to call 770-724-7850.